By Hongkiat Lim in Social Media. Updated on September 17, 2018 . If you’re reading this, chances are you are encountering a temporary ban on your Instagram account. There’s no need to worry though as there are a lot of people who go through this prohibition from Instagram. Basically, social media networks, like Instagram, keep strict user policies so that every user continues to have a good experience. However, it may happen that your seemingly normal activities raise a red flag and then next thing you know you’re banned from the site. Let’s get right on to it. How to tell if you’ve been banned on Instagram? It’s pretty simple and straight forward to tell if you’ve been banned on Instagram. If you’re reading a message that looks something like the following image, consider your account to be banned. You will also know when you’re unable to perform certain actions e.g. uploading photo, like, follow or comment, you’re likely being banned. What causes an Instagram ban? Here are some of the reasons that can cause your Instagram account to get temporarily-banned. See if you can relate to any of these activities. It is quite likely that if you follow people they will follow you back. However, mass following and unfollowing people in a short period of time may get you into trouble. The reason behind it is that such a behaviour makes you look like a typical Instagram bot causing the platform to ban your account. On Instagram it is quite normal to like 3 to 5 phots in a minute, but liking a good number of photos (around 100) in a minute makes your account suspicious. As such an activity can only be associated with a bot, resultantly Instagram would probably ban you. There are many third-party apps out there that come with many lucrative offers to improve your Instagram account’s position. These apps can help you gain a lot of followers, auto comment on other people’s photos to gain more exposure or followers. Yet all of this comes with a great consequence. Using a third-party app for all these actions on Instagram means you are following a certain pattern (like a bot) and as Instagram’s algorithm is smart enough detect these activities, your account will most likely be banned. Commenting on the photos is a good way to give more exposure to your own account. However, commenting too quickly on too many photos or using a third-party app to do so can lead your account to a temporary ban on Instagram. Yet another reason for causing Instagram to ban your account is by posting similar or same comments multiple times on people’s photos. Here too a third-party app can lead you into trouble as they post generic comments on people’s photos that are similar to each other and are mostly not related to the photos. How long does a temporary ban last? If it’s your first time facing a temporary ban on Instagram, you may be wondering how long would it last. Well, it depends on how many times you’ve been banned, and what you did that triggered the ban. Usually, the duration of a temporary Instagram ban ranges from few hours to 24-48 hours. The duration of ban also depends on your follow up actions. If you would continue doing the wrong actions, the ban may prolong. So if it’s your first time with a temporary ban, you better start behaving. Can you get banned on Instagram permanently? The risk of getting permanently banned depends on your activities after the temporary ban. If you keep spamming, mass following, and unfollow, and continue to post too many random comments on people’s photos, you may end up getting a permanent ban on your Instagram account. 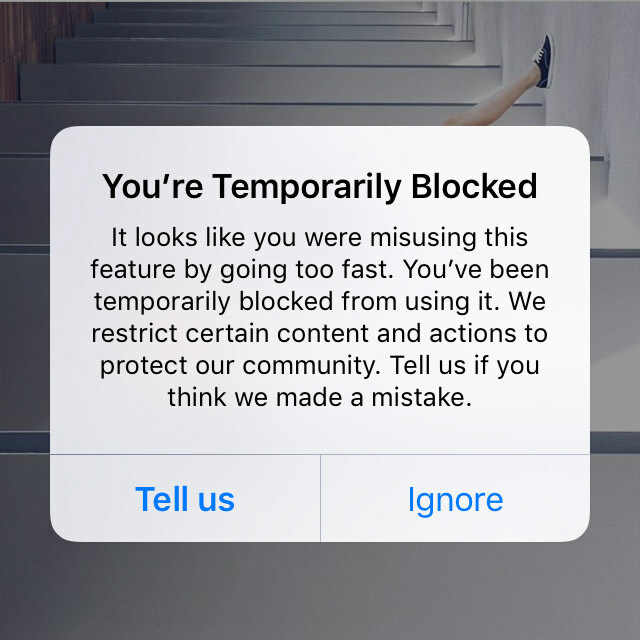 How to recover from Instagram temporarily ban? Here are a couple of things you can do to recover your temporarily banned account on Instagram and continue with your activities like before. If you have been mistakenly doing something that caused a temporary ban on your Instagram account, you can report your case to the administration clicking the "Tell Us" or "Report" option. As a cautionary measure you should stop all actions for at least 2 days. By that I mean no liking, commenting, following or unfollowing. Though you can continue browsing Instagram. On the 3rd day, resume using Instagram with normal activities avoiding anything that would make you look like a bot. Like and comment only a couple of photos a day and even try uploading a photo to see if things are working fine. How to avoid being banned by Instagram in the future? Following are a couple of things you can do to avoid the inconvenience of getting your Instagram account banned. As I’ve mentioned above, third-party apps that offer to promote your Instagram account actually cause more harm than good. So as a first step you should immediately stop using third-party apps, if you’re using any. In reality, if you want to attract authentic traffic and genuine users to your account, it’s best to promote your account manually. It is a good idea to link your Instagram account with your other social media account. In case Instagram considers your account suspicious, linking to other social networks would make you seems more legit. 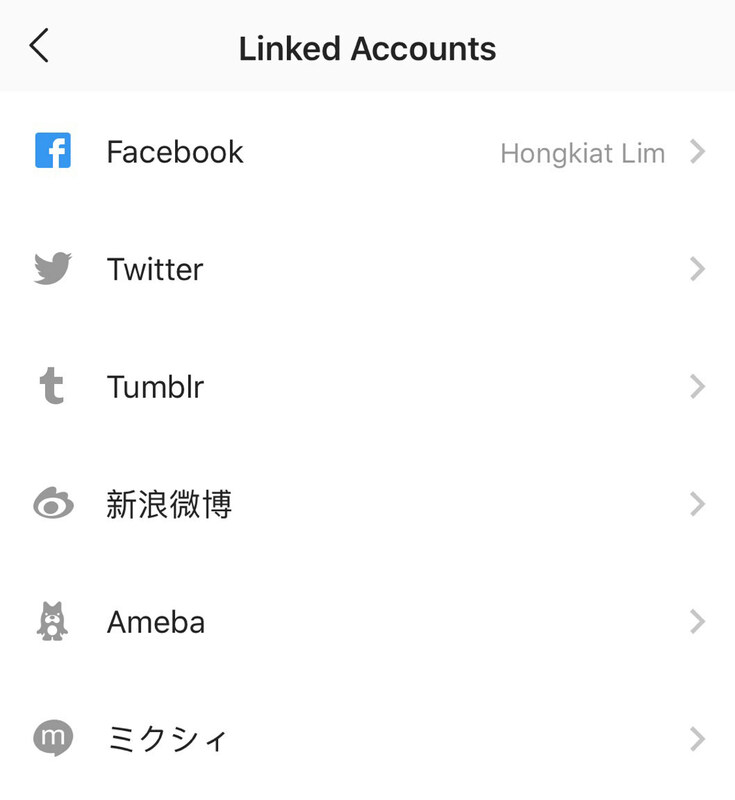 Under Options, go into for Privacy and Security > Linked accounts. Link to as many social networks as possible. The first thing any social network checks about a suspicious account is the profile. The more complete the profile, the more authentic the user is considered. Take a look at your Instagram profile and fill out if there’s anything missing there. Last but not least, stop abusing or spamming the system. Like, follow, and comment in an orderly manner with at least 10 seconds in between your actions. This would distinguish you from a spammer or a bot and you’ll be able to continue your experience with Instagram without any risk of getting banned.